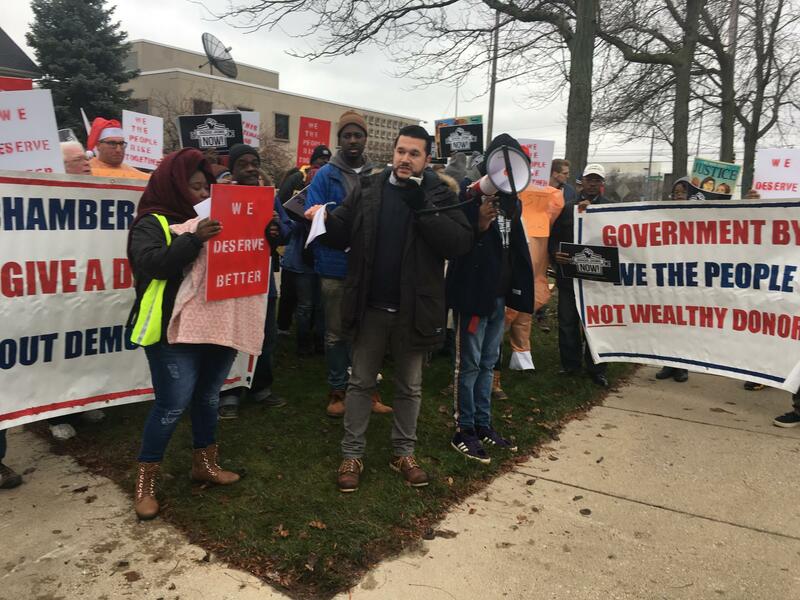 Several Michigan groups joined together Monday to protest bills being pushed through the lame duck session that they say would hurt working families. Advocacy groups protest lame duck changes to legislation outside the Michigan Chamber of Commerce on Monday. Advocacy groups protest outside the Michigan Chamber of Commerce on Monday. Groups including Progress Michigan, Good Jobs Now, and We the People – Michigan protested outside the Michigan Chamber of Commerce in Lansing. They sang altered Christmas carols to protest attempts to change earned sick time and minimum wage increase laws. They say those proposed changes would hurt average workers. One of those efforts would change a former ballot initiative so that it would delay the minimum wage increase to $12 until 2030. Branden Snyder with Good Jobs Now said that change would hurt people struggling to get by. “You can’t pay for rent anywhere in the country on what we have as minimum wage,” said Snyder. The Michigan Chamber of Commerce said its focus is to advocate for bills that encourage job creation and economic growth.